Ask fellow campers about "City of Douglas" and nearby attractions. We stayed at the new section called Hidden Treasures, which is located near the 5th green of the City golf course. You actually have to drive through the golf course itself to get to it, which is kind of strange. The pro shop employee was very nice, though, and guided us to the area with a golf cart so that we could find it. There were no restrooms or showers, and no WiFi service. The only thing available was electrical, sewer and water. Until they add to this area, you would probably be better off staying in the area near the pro shop that is only $20 per night, because at least there you have access to restrooms and showers if you need them. It was very quiet, and pet friendly, but definitely not worth $30 per night. We camped at City of Douglas in a Travel Trailer. The City of Douglas is very small, but there is a small shopping area with a Walmart, JCPenney, fast food, etc. The previous camper summed it up. We paid $82 for a week. Plenty of sightseeing in Cochise County. Easy access to Mexico. Walmart near border. Will stay again. We camped at City of Douglas in a Motorhome. 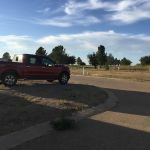 This is basically a large paved parking lot that backs up to the county fair grounds horse racing track, and looks out on to the golf course. They only have 30 amp electric at the sites. The showers are dated but clean, with great pressure and lots of hot water. There were a number of snowbirds here, but the sites were not cluttered. We paid $16.49 for the one night we were here. There's a bar on site but the restaurant was going to close a few days after we left. They have some pretty fast WiFi, and Verizon and MiFi works fine here. If you're in Douglas, this looks nicer than some of the other parks in the area. We'd stay here again if we're in the area. The shade trees are on the west side of the parking area and looked mainly to be long term sites. Their weekly and monthly rates were pretty reasonable. We camped at City of Douglas in a Motorhome. This RV park is a paved area at the public golf course. There are no amenities other than the golf course and restaurant. The sites are level side by side except for the back-in that are reserved for long term. It is situated about a mile from city center and the Mexico border. The city police patrol at regular intervals so even being on the border there are no issues. If you are looking for a base camp to explore south east Arizona this is a good bet. We camped at City of Douglas in a Fifth Wheel. Are you affiliated with City of Douglas ?